At the Carnival of Flowers which is held in Spring each year, a day is hardly enough time to take in all of the beautiful gardens that are open. The Wisteria at the top is growing on a large circular metal frame and makes a stunning feature in the back garden of this home. Centre photo. This Clivia looks so much at home nestled in the tree. Bottom photo. I'm sure we'd all love a garden bed like this to grace our driveways. These photos are worth a click on. I think that fascination with plants increases with age. That's not to say of course that some young people are not avid gardeners. But an analysis of the demographic at various garden/orchid shows etc. would suggest that some of us old timers predominate. Goodness what am I saying! I'm only 64 maybe i might be classified as a mid timer. 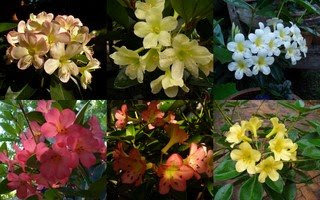 Anyway enough waffle, my latest interest are Rhododendrons of the subgenus Vireya sometimes referred to as Tropical Rhododendrons. Like my other interest Hoyas, many of these plants are epiphytic in nature and have very small and fine root systems. They are found at altitude in mountainous regions of S.E. Asia and New Guinea. There is an abundance of hybrids in cultivation and most flower twice a year some even more. Above are just a few that have flowered for us this Autumn.